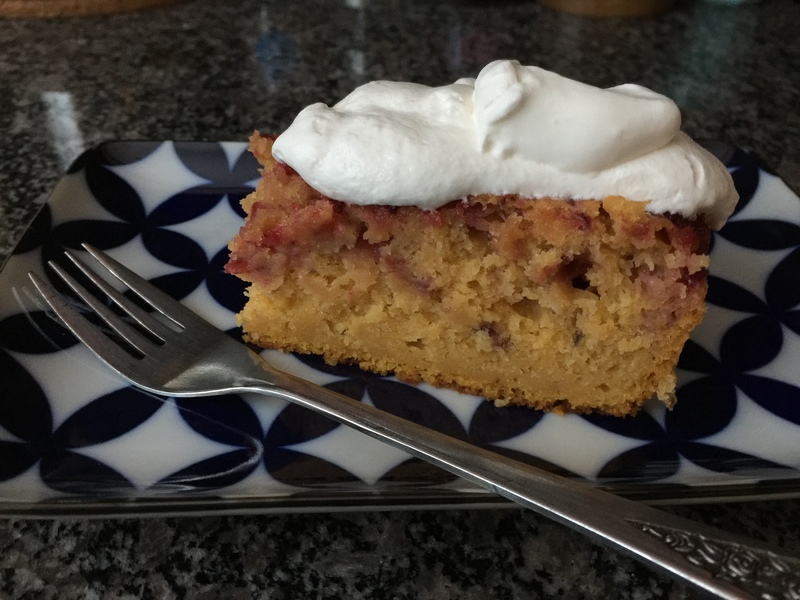 Recipe: Sweet Potato Cake with Cranberry Orange Relish. – Recipes & Food Writings. Christmas has come and gone, but that doesn’t mean that holiday baking has to be over – especially since winter JUST started. For me, holiday type of baked treats don’t stop coming out of my kitchen until late January. Most things that are branded as “for the holidays” are spiced with cinnamon, cloves, and all sorts of other warm spices. While those are all delicious and things that I love, I wanted something that tasted like the holidays in a cleaner, fresher, and different way – without using all those spices. So I came up with this sweet potato cake with cranberry orange relish. Thanks to my lovely guinea pigs coworkers, I was able to perfect the recipe in three attempts. The first pan was delicious and devoured quickly, but there wasn’t enough cranberries and it tasted like it was missing something. The second pan with adjustments made was raved about during a potluck at work. And the third pan was perfect according to a coworker who had the honor of trying all three. It looks like there are a ton of ingredient and that the cake might be complicated to make, but it comes together quickly and easily. All you need is sugar, mashed sweet potatoes, milk, oil, maple syrup, vanilla, an egg, baking powder, salt, flour, and cranberry orange relish. I’ll explain more about the sweet potatoes and cranberry orange relish in a bit. 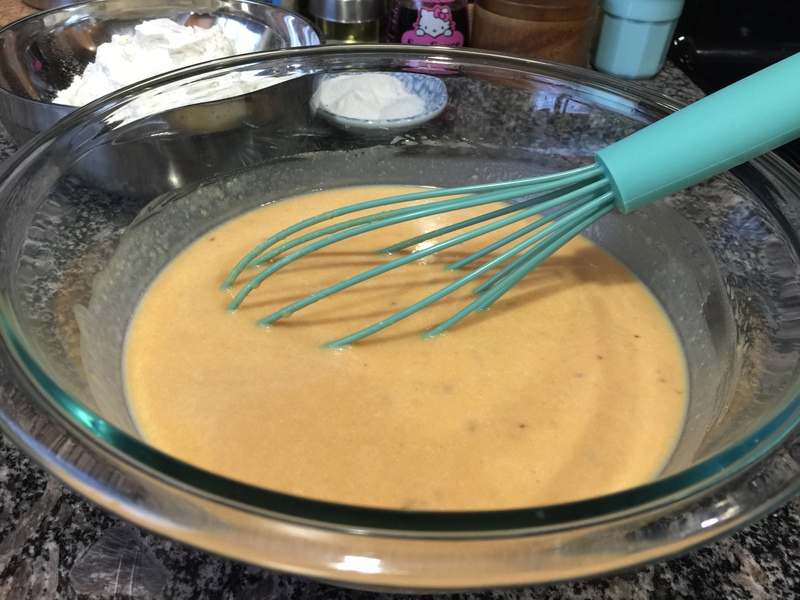 In a large mixing bowl, whisk together the sugar, oil, egg, maple syrup, and vanilla until it’s all well combined and some of the sugar has dissolved. Now you whisk in the sweet potatoes. I’m a fan of using leftovers, so if you have some leftover mashed sweet potatoes from dinner, feel free to use it – even if it’s mixed with other stuff. You can also use mashed candied yams. Just reduce the amount of sugar in the recipe by a quarter of a cup especially if they have marshmallows in them. If you don’t have any sweet potatoes that are already cooked, just boil a couple until tender, then put it through a food processor with a tablespoon of water and a tablespoon of sugar and blend until smooth. Or just mash it with a fork. Once the sweet potatoes are mixed in, you stir in the milk until it’s all combined. It’s going to look really runny and you might question if it’s right, but I assure you it is. Make sure the potatoes are all mixed through the milk before going onto the next step. Now you whisk in the baking powder, salt, and flour until you have a smooth batter with no lumps or dry spots. 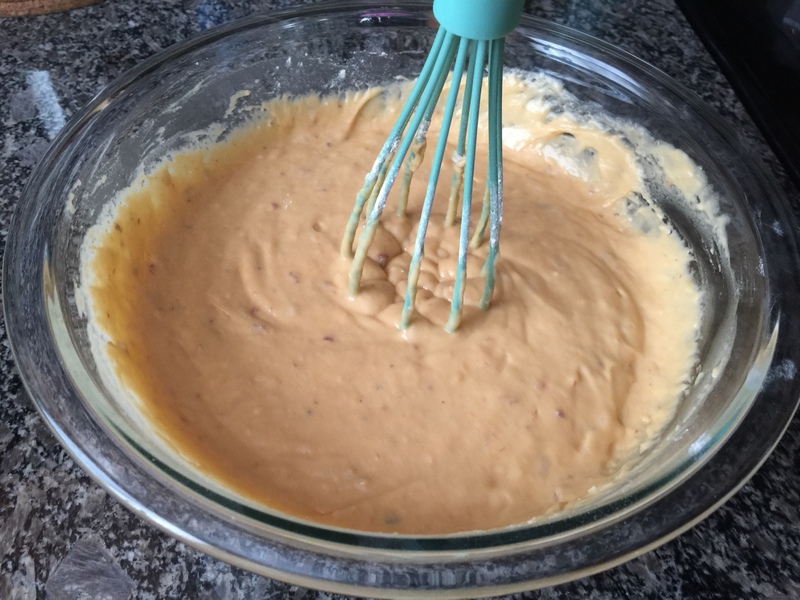 The batter is going to be very thick at this point and you might feel like it’s too thick, but it’s not. 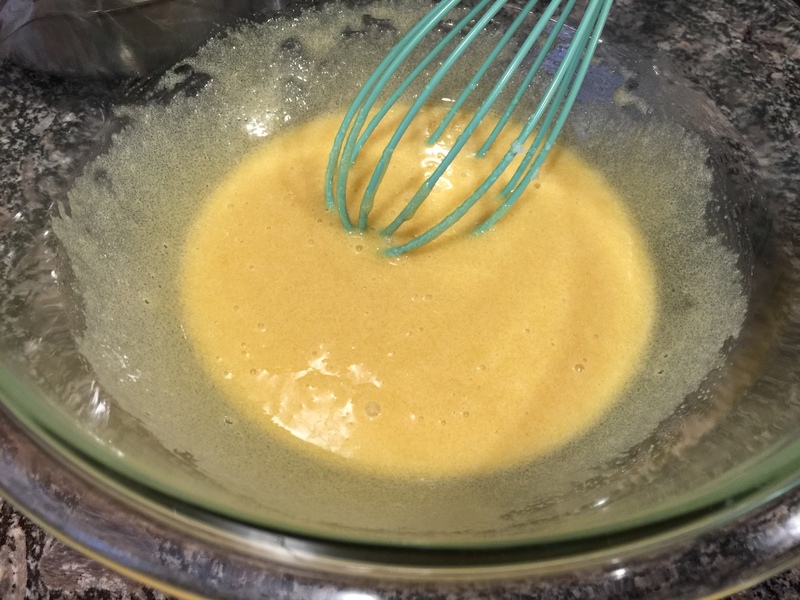 A whisk should be able to stand up in the batter for a few seconds (as pictured above). Pour the batter into a greased pan and spread it out so that it’s even. 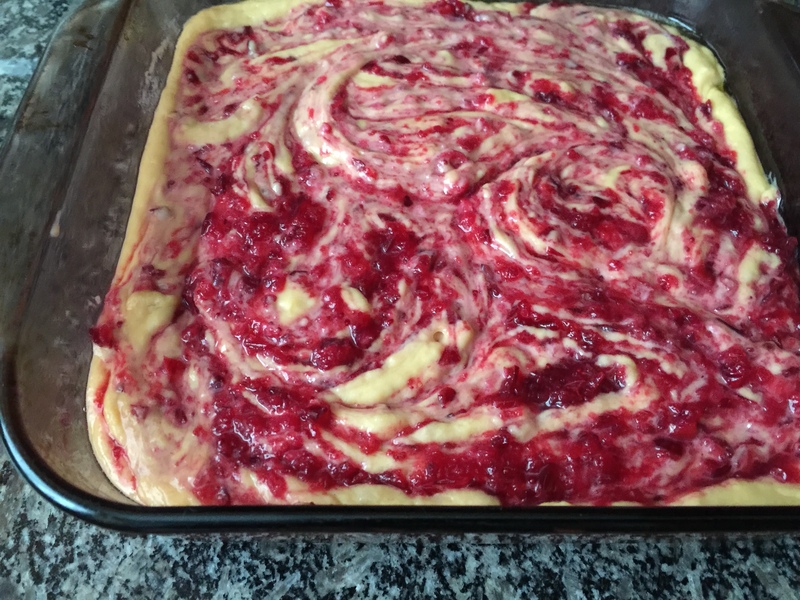 Then you take the cranberry orange relish and put spoonfuls of it on top of the batter. Again, I’m a fan of using up leftovers…So if you have plain cranberry sauce (either homemade or store bought) with orange in it, use that. If you have plain cranberry sauce (again store bought or homemade works), add some orange zest to it and use that. To make the cranberry orange relish from scratch, take two cups of whole cranberries (either frozen or fresh) and chunk it up in a food processor. Put that in a sauce pan over medium heat with a third of a cup of sugar, the zest of one orange, and two tablespoons of orange juice…Let it simmer for 20 minutes or longer if needed to make it thick. Once the cranberry orange relish is dotted over the top of the batter, swirl it around with a butter knife to make it look like the Starry Night painting. Be sure to spread it to the edges and into the corners as well. You want every bite of the cake to have some of the cranberry and orange. Put it in the oven and bake it for nearly an hour. A toothpick inserted into the center should come out with a few moist crumbs or clean. It’s going to be very puffy, but it’ll sink a bit once it cools down. Don’t panic – the sinking is normal. It can be eaten warm or chilled, though it gets a touch bit denser after being in the fridge in a good way. Top off with a dusting of powdered sugar, or whipped cream, or leave it plain. It’s delicious no matter which way you eat it. Preheat the oven to 350° F. Prepare your 8×8 or 9×8 baking dish with non-stick spray or by greasing with butter and dusting with flour. In a mixing bowl, combine sugar, oil, maple syrup, vanilla extract, and egg. Whisk together until well combined and some of the sugar has dissolved. 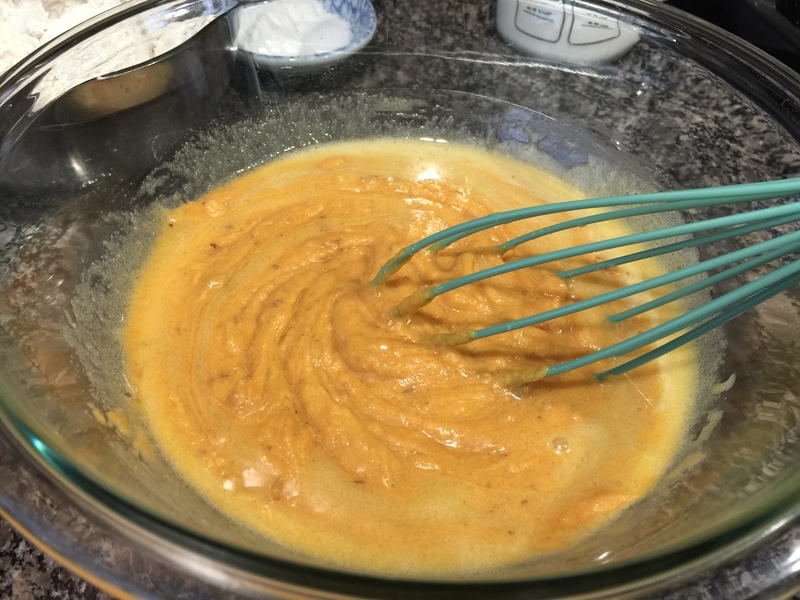 Whisk in the mashed sweet potato until combined. Add in whole milk and whisk until everything is dissolved and combined. Using the whisk, stir in baking powder, salt, and flour. 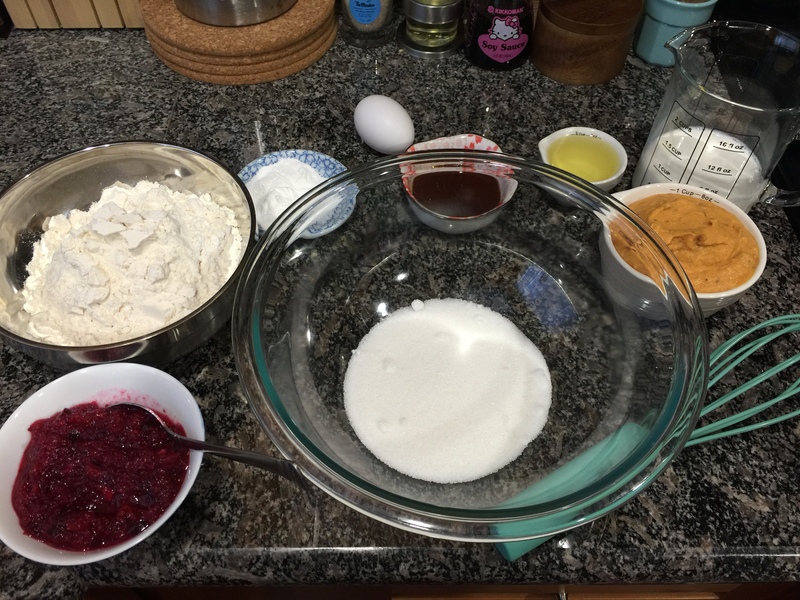 Keep mixing until there are no dry spots of flour and the batter is smooth with no lumps. 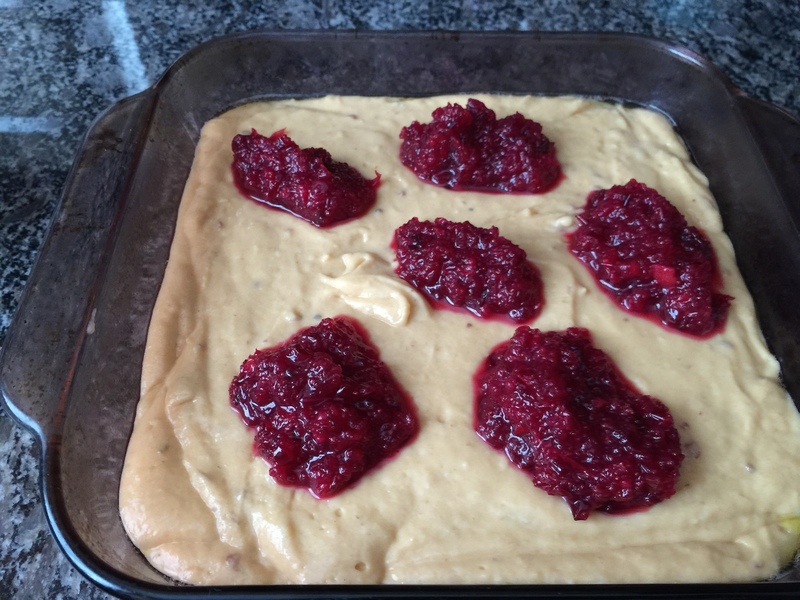 Pour the batter into the greased baking dish and spread it out into an even layer. Dollop the cranberry orange relish by the spoonful on top of the batter and use a butter knife to swirl it around into the batter. 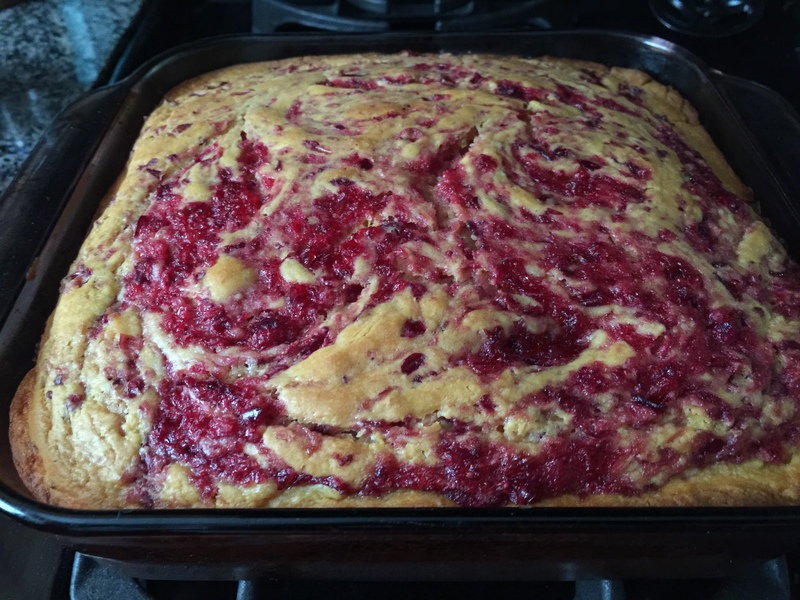 Be careful not to over-mix the cranberry into the cake batter. Bake for 55 minutes. When done, the cake will have doubled in size and a toothpick inserted into the center will come out with a few moist crumbs or clean. Let cool in pan at least 30 minutes if serving warm. Place in fridge overnight if serving chilled. Top with a dusting of powdered sugar or whipped cream if desired. This recipe is a great way to use up a couple of leftovers from holiday meals and is easily doubled to make a 9×13 pan.